(Submitted Photo) February 19, 2016 – USS Freedom in the San Diego Bay starting her engines. Update 10:00 am – Early this morning littoral combat ship USS Freedom (LCS 1) was making preparations to get underway after a prolonged maintenance period pier side. After the ship’s diesel engines were started, black smoke could be seen emitting from the ship. The black smoke was a result of carbon build-up being burned off after sitting idle for nearly 9 months. 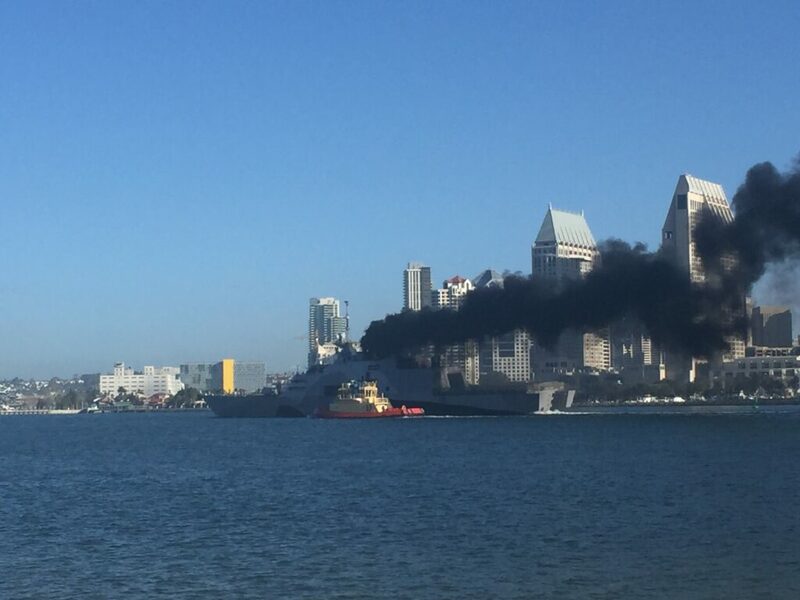 Navy Ship USS Freedom was emitting dark black smoke this morning in the San Diego Bay. At press time everything appears to be ok. No details on what caused it.